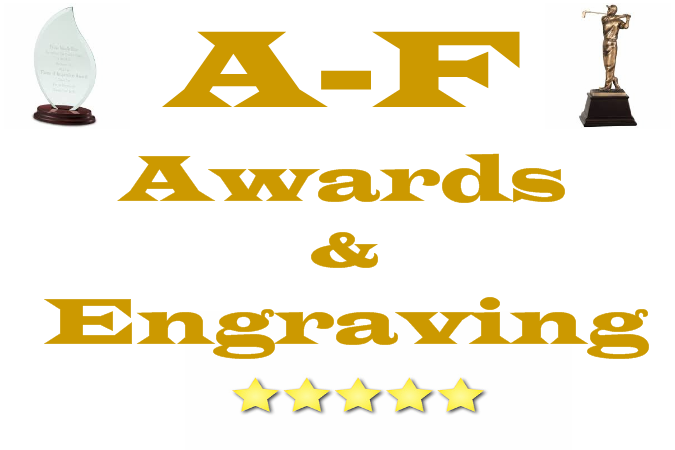 All of us at A-F County Market look forward to assisting you in your shopping experience. A-F County Market is local family owned business founded on customer service and community involvement since 1989. We belong to the Adams County Chamber of Commerce and support our local churches, youth organizations, and other non profit groups with our Sharing Program and through product donations. We are open from 6 am to 10 pm daily to provide you with products you need. We are proud of our quality meats, fresh produce, and our many made from scratch bakery and deli items. Our liquor department features the area's largest selection of beers, wines, and liquors at competitive prices. Remember, A-F County Market is staffed by your friends and neighbors from down the street. Stop in and say, "Hello"! 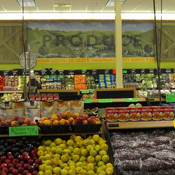 Our produce department is bigger and better than ever. We have added many new items including organic's! Our knowledgeable friendly staff is happy to answer any questions you may have. Fruit baskets are a pleasure to give or receive! We offer an extensive variety of beautifully arranged gift baskets for any occasion made with the freshest in-session fruit available. Personalize baskets by adding cheese, crackers, or candy, just to name a few. 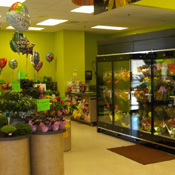 Fruit Baskets can be ordered by calling or stopping by the produce department. Phone orders may be placed from around the world; we accept MasterCard and Visa as payment. We provide a variety of fresh cuts of savory meat including Certified Angus Beef, pork and chicken. Ground meats are ground fresh a number of times each day. Stop in or call meat manager, Bill, or one of his experienced cutters for a specialty cut. Our bakery offers a wide variety of breads, rolls, cakes, donuts, and sweet goods. Call ahead or stop by to order cakes and large amounts of rolls, breads, and sweet goods. When ordering cakes, browse through our selection of edible images and figures. If you don't find what you are looking for bring in any photo, picture, or drawing and we'll put it on your cake. Be sure to place large bakery orders early to ensure availability. Don't feel like cooking? We have a wide variety of hot and cold deli items ready for a meal. A variety of sandwiches are made fresh every day for your enjoyment. Hot case special change daily, but fried or rotisserie chickens are always available. On Fridays stop by for baked or battered fish dinners and sandwiches. Call ahead to order your chicken or fish to avoid a long wait at the counter. Our deli has a vast range of trays to meet your needs and will design a menu to make any size party a success! Brochures are available at the Deli counter. Orders must be placed 2 days in advance. Sometimes, the simplest gestures make all the difference, like fresh flowers from A-F County Market. From the most elaborate arrangement to the simplest bouquet, we make every fragrant bunch beautiful. Phone orders may be placed from around the world and delivery service is available. Come and see our newly expanded dairy and frozen foods department, offering a wider selection of foods. We provide a wide variety of milk, cheese, butter, eggs, frozen fruits, vegetables, ice cream, frozen dinners, juices, and pizzas. 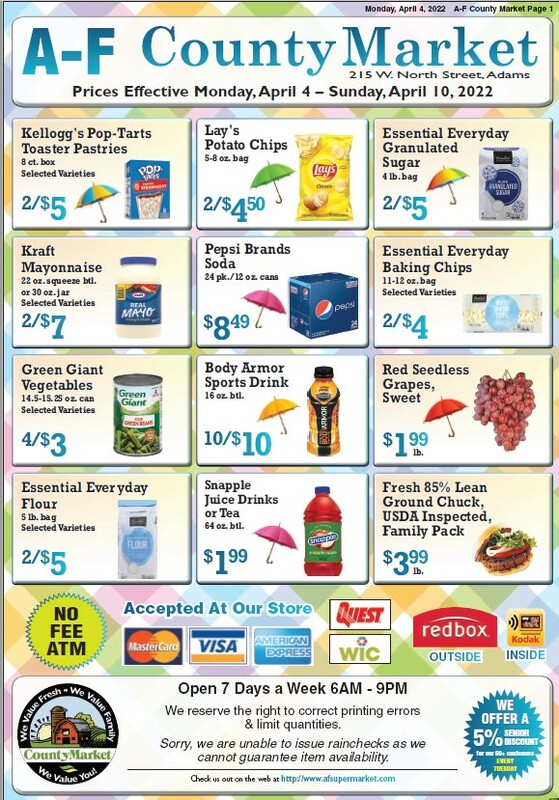 Look for Essential Everyday products through out the frozen department. Our liquor department is open everyday from 8:00 am till 9:00 pm. The liquor department boasts a wide selection of beer, wines, and spirits. 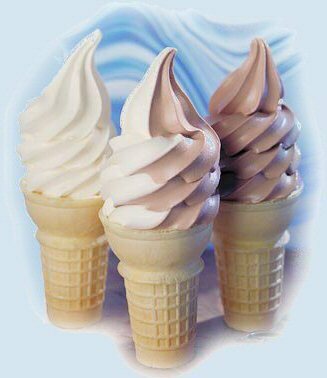 Check out our new flavor burst soft serve machine which has the ability to create 8 different flavored ice cream cones and shakes. All located right next to the floral department. Summer hours for the Ice Cream Shop are 10am - 9pm.